The first time The Monkeys saw yellow capsicum, they raised a skeptical eyebrow or two. Even after my assurance that yes, it was still a capsicum, yellow it may be. Yes, but they are also yellow. Now come on, eat it. It is capsicum! They happily declared. 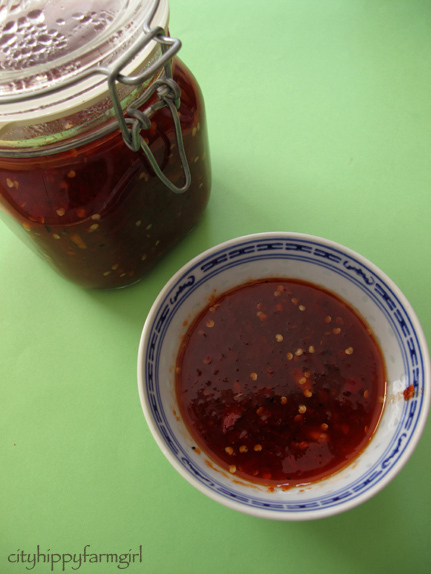 This entry was posted in Food Glorious Food, Making, Creating + Frugal Living and tagged bell peppers, capsicum, local olive oil, locavore, Making, Creating + Frugal Living, pepperonata, peppers, seasonal garlic, slow food by cityhippyfarmgirl. Bookmark the permalink. You could pick them out Joanna, I wouldn’t mind…promise. Looks wonderful and the leftovers would be so good on pizza, if there were leftovers. I love pepperonata. It’s not only good for you it looks pretty as well. I usually remove the skins by blistering them but perhaps that’s not necessary. And yes, I think chorizo would go very nicely with this. And isn’t it great that your children like to eat raw vegetables – so good for them. I’m quite thankful The Monkeys like their vegetables, makes life a whhhole lot easier. I agree, pepperonata is a winner. Any leftover (not that we usually get much of that) would also be a nice addition to a quick and tasty omlette. Thanks for remining me to make this again as it’s been a long while. Perfect for an omelette Anna! 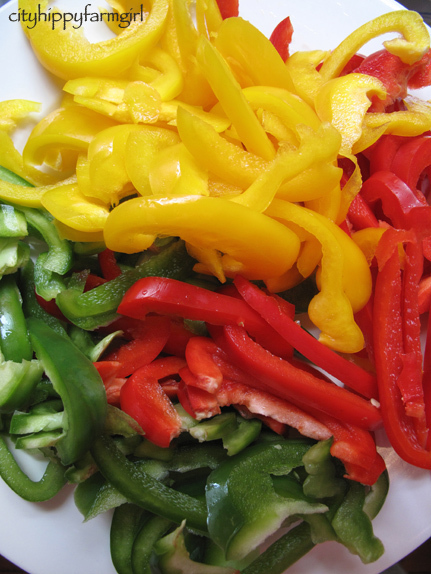 I love adding color to a dish through peppers! Each color seems to have a different level of sweetness, mildness or spiceness too. They do don’t they. I think I like the red the best…they go faster. As well as being great by themselves, the foundation for many a great dish…like turkey chili! Lovely pics. I’ve never had turkey chilli, but sounds good. It’s hard to go wrong with vegetables screaming their colour to you. They’re simply not as pretty are they. I eat this all the time in Italy, but I have never made it!!! I will now. You can also add tomato and onions to it, keeping it really simple for Frugal Friday I didn’t, but the other additions also are good. Aah simplicity at it’s best. I usually skip the green fellows and ue the orange once instead. Tandy and Mandy, the orange ones I only see very occasionally. Are they sweeter like the yellow ones? they are lovely and sweet! I’ve encountered this term “pepperonata” before but I’m certainly familiar with this dish. 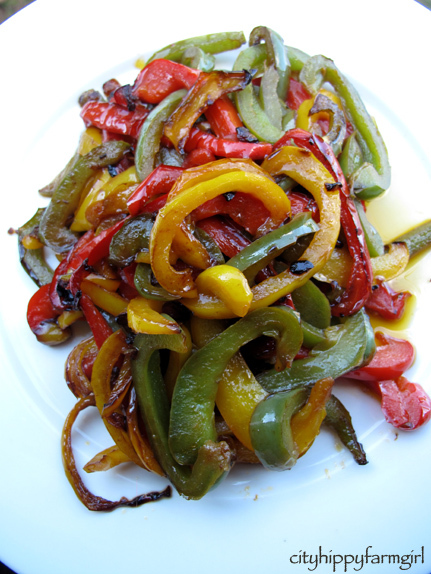 We just call it sautéed peppers. I’ve not put chorizo in it either, and that’s something I intend to rectify very soon. Thanks for reminding me of this very tasty dish. I love pepperonata, the simplicity, the varying degrees of sweet and savory all in one dish. Love on crostini with a thin slice or smear of cheese. You’ve managed to make limp vegetables LOOK awfully pretty though, and that’s not easy! Very pretty- I would use orange instead of green, as well- the orange are very sweet. But I’m the only one who would eat them by themselves- add pizza dough and some spicy Italian sausage and cheese and there would be many takers!